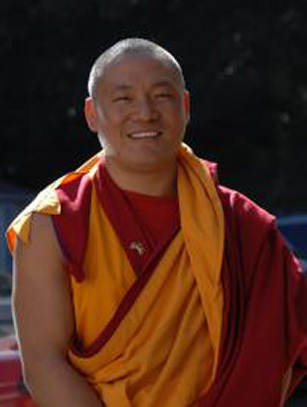 Geshe Lobsang Dhargey was born in 1969 in the Bomdilla district of the state of Arunachal Pradesh, North East India. At the age of ten, he entered Sera Mey Monastery, which is one of the largest Tibetan monasteries. He then began his long monastic training under the Venerable Gyumed Khensur Rinpoche Lobsang Jampa, his personal tutor and Spiritual Director of DNKL. Geshe-la received his ordination as a novice monk in 1982 from the late Kyabje Ling Rinpoche, the senior tutor of His Holiness the 14th Dalai Lama and the 97th Throne Holder of the Gelug tradition of Tibetan Buddhism. He then received the vows of a fully ordained monk, a Bikshu, in 1994 directly from His Holiness the Dalai Lama. After 15 years of study, Geshe-la appeared for the All Gelupga Monastic University examination in 1998 and was awarded the highest monastic degree, that of Geshe Lharampa. For the final part of this examination, Geshe-la had to go to all the three great monastic universities of the Gelugpa tradition, namely Sera, Ganden and Drepung, to engage in philosophical debates with the finest of monk scholars. As tradition mandates, after successfully completing studies in Buddhist Sutra, Geshe-la went to Gyumed Tantric College in 1999 to study Buddhist tantra. In 2002, he topped the debate examination conducted by those monks who held Geshe Lharampa degrees at Gyumed Tantric College. He received the Ngagrampa degree in Buddhist Tantric Studies. Geshe-la also served in the “Education Development Committee of Sera Mey Monastery” from 1999 to 2001. Geshe Dhargey is a gifted Buddhist teacher who has taught not only in Sera Mey Monastery but also in the West and is now the Resident Teacher at Do Ngak Kunphen Ling in Redding, CT.